I’m home safe and sound and everything went extremely well, from the moment I first contacted you to the very end of the trip. My sincere thanks for a well planned holiday. I found the presentation of your website very exciting and when I delved into it discovered it was extremely easy to use. When I required more information your response was timely and to the point. I can’t speak too highly of my driver, Khalid. He was always on time meeting me each day – in fact, sometimes a little early – he had a good understanding of Moroccan history which he shared with me as we drove, although he made me aware of the fact that he was not my official guide. He was conscious of my well-being throughout the trip, advising me not to go out alone at night. One or two of the daily drives were extra long and Khalid offered to stop for coffee or the toilet whenever he felt it was appropriate. I enjoyed his unfailing good humour. Th vehicle was always clean with fresh bottled water each day. Local guides used at each town were knowledgeable and competent, especially the female guide who escorted me around Marrakech. Places visited were extremely interesting, especially Marrakech and the night in the dunes (the “luxury” tent particularly so!). The drive across the High Atlas Mountains was a truly wonderful experience as was the excursion to Essaouira; I spent a wonderful day in this idyllic fishing community. It is a three and a half hour drive each way, however, and, as one would need to spend around five hours walking through the town I feel it is too long as a day trip. I would suggest there be one stopover night here and only two in Marrakech. 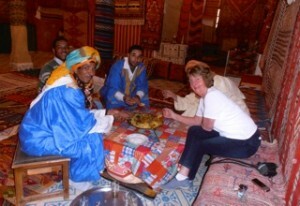 I felt the itinerary exposed me to many facets of Moroccan life and culture, much of which I knew little about. The accommodation throughout was of high quality and at times exceeded my expectations, particularly Riad Kniza in Marrakech. Another hotel particularly worthy of note was Chateau Relais Hotel le Doge in Casablanca. As you might expect, I did find the food a little challenging at times! Overall, I am delighted I chose this holiday and your company’s service. I would happily recommend you to others contemplating a Moroccan holiday.